High quality, long lasting, low maintenance materials mostly consisting of glazing and aluminum paneling, create a high-end, sophisticated architectural design. Designed and oriented on site to take full advantage of natural daylight and views and provide a high level of energy efficiency. The abundance of glazing, the long east-west floor plans and shallower north-south depth allows the interior of the building to achieve natural daylight and permits views to the exterior for 90% of the spaces when utilizing an open office layout. Sun exposure is controlled to reduce harsh glare and heat build-up through the use of deep southern overhangs and sunshade devices. Building is targeted for LEED Silver or Gold certification. Solar panels provide onsite renewable energy. The onsite renewable energy along with the use of a Variable Refrigerant (VRF) mechanical system, energy efficient lighting, proper building orientation, high performance efficient glazing and other factors enable the building to achieve increased energy efficiency, 15%-20% above California Title 24 requirements, resulting in reduced energy costs. Efficient water fixtures installed throughout the building reduce water waste and water costs. Recycling program to reduce building waste. Building will be wired for fiber-optic / high-speed connectivity. A low maintenance plant material palette combined with an irrigation system that utilizes the latest water conservation technologies will provide maximum water efficiency and reduced water costs. Trees are strategically placed to provide shade at seating areas, along walkways and in parking areas. Upon full build-out of University Office Center's master plan, the site will include outdoor amenities such as a bocce ball court and lawn area for large gatherings. Abundant on-site parking is provided. Approximately 15% of the parking stalls will be covered with carport structures, while additional parking areas will be shaded as the trees mature. On-site priority parking for energy efficient vehicles as well as electrical vehicle charging stations are also provided. Bicycle transportation and access is made convenient via the proximity to the city’s bike path along with onsite dedicated bicycle parking enclosure and indoor showers and changing rooms in the first floor restroom facilities. On campus access to city bus routes. 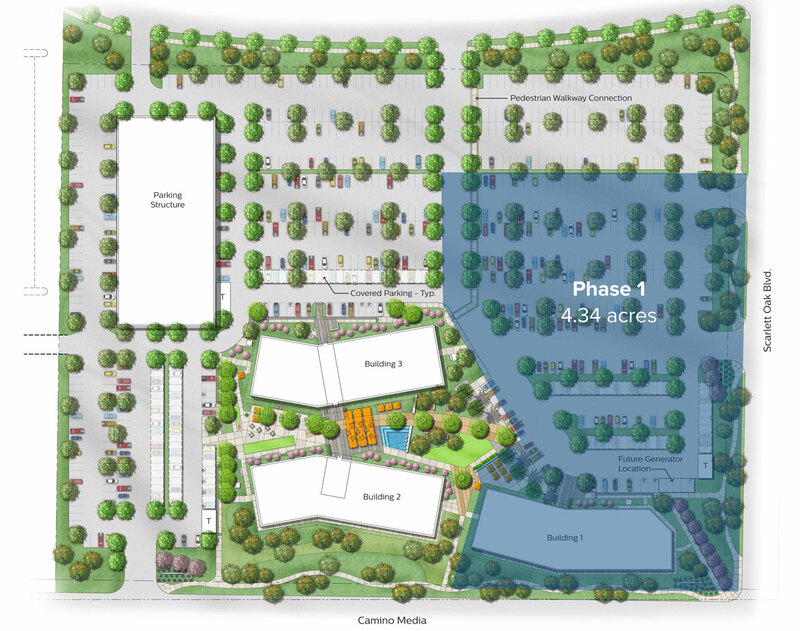 Walkability of site is ideal given The Marketplace, an upscale lifestyle center, which provides ample dining, shopping, entertainment and other amenities across Camino Media from the property. The University Office Center is planned for a total of 285,000 square feet of professional office space on 12 acres of land and will provide ample parking and outdoor amenities such as a water feature, shaded seating areas, a bocce ball court and lawn area for large gatherings. Phase 1 of the University Office Center master plan is a Class A professional office building featuring 3 stories and 60,000 square feet of rentable office space. Some key highlights of the building include the intelligent and sophisticated architectural design along with water and energy efficient building equipment and technologies.